December 25, 2008 -- It a took a few attempts by the caller at our back door to make me understand that Blue, our resident Paint mare with a left blue eye, was probably at this minute dripping blood on the public bike trail -- at a dead run. 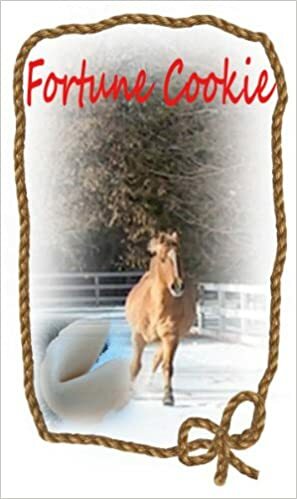 Blue had spooked at a loose blanket strap, bolted through the front of her day turnout, hung a sharp left, bolted down the turnout lane, crashed through the gate to the east pasture, galloped across the pasture and crashed through the four-and-a-half-foot city-built fence along the bike trail. In 19 years, no horse has ever escaped our stable, let alone go through three fences to do it. My parents, my children and our guest dropped the last preparations of Christmas dinner, grabbed our jackets, and ran for the bike trail. Young Chuck in Montana bought a horse from a farmer for $100. The farmer agreed to deliver the horse the next day. The next day he drove up and said, "Sorry son, but I have some bad news, the horse died." Chuck replied, "Well, then just give me my money back." The farmer said, "Can't do that. I went and spent it already." Chuck said, "OK, then, just bring me the dead horse." Chuck said, "I'm going to raffle him off." Chuck said, "Sure I can. Watch me. I just won't tell anybody he's dead." A month later, the farmer met up with Chuck and asked, "What happened with that dead horse?" Chuck said, "I raffled him off. I sold 500 tickets at two dollars a piece and made a profit of $998." Chuck said, "Just the guy who won. So I gave him his two dollars back." Chuck grew up and now works for the government. He was the one who figured out how to "bail us out."